Grave Ref. : II. J. 7. Thomas William Tagg was born at Toad Hole Cottage, Toad Hole, Jacksdale on 24th February 1885, first child of John Thomas Tagg (born 27th January 1863) and Fortuna Ann Tagg (nee Waterall ~ born 3rd Feb 1865). His father originated from Codnor and was an Engine Winder at the nearby Pye Hill Colliery. Thomas, known to the family as ‘Will’, was the eldest of 5 children. 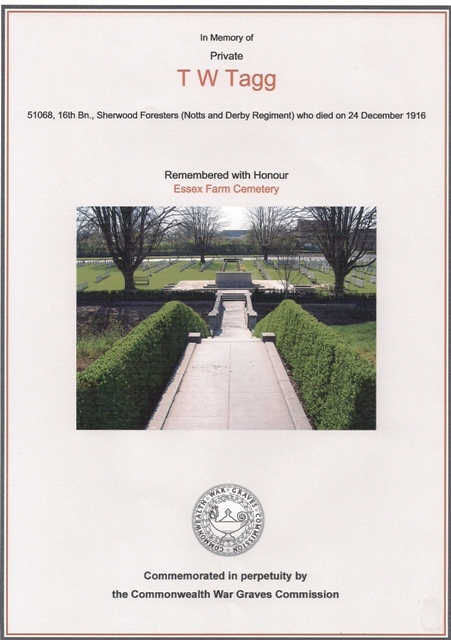 His brother Frank who also served in WW1 and is named on the Jacksdale War Memorial, was born on 20th July 1886. 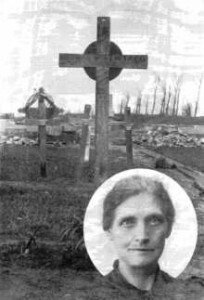 Next in line was Elsie Tagg born 17th Dec 1892, mother of Mrs Joan Lowe of Barrows Hill Lane, Westwood. Ida Grace was born 5th Feb 1899 and John Waterall Tagg on 24th Nov 1903. Will and his brother attended Selston Church of England School with Elsie following them several years later. Will later married Annie and they had one daughter named Gwendoline. They lived in York Avenue Jacksdale. His brother Frank did not marry until after his return from the war. 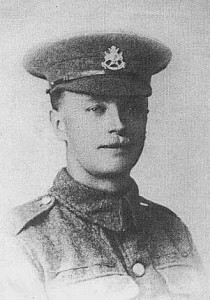 Will was employed at James Oakes Pipeyard before he enlisted in the Sherwood Foresters at the Eastwood registration office on 8th June 1916 at the age of 31. After training he was sent to France in October 1916. Sadly, his military career was to be short. He was wounded in the battle South of Ypres, Belgium and later died of his wounds on Christmas Eve, 24th Dec 1916 leaving his wife Annie and daughter Gwendoline thought to be about 7 or 8 years of age. Gwendoline later went on to marry and had a son named John. Will was awarded the British War and Victory Medals. He left personal effects amounting to £3 11s 11d which, after a pay correction of 1s 3d had been deducted, left £3 10s 8d for his widow Annie. A £3 war gratuity was also sent to her in October 1920. A Roll of Honour published in the Free Press in 1917 pays tribute to the 37 soldiers lost to the Parish up to that date, at which time Will Tagg was the most recent casualty of the war. The article reads “In fulfilling the promise of last week to insert a full list of those who have fallen in action, the writer desires to acknowledge his indebtedness to the curates-in-charge of Underwood St Michael’s and Westwood St. Mary’s Churches – the Revs. JS Calllister and J Kahn – who have kindly provided details of the Honours List in their respective wards. The total number of those from our parish who have fallen is 37, composed of 15 from the Jacksdale Ward, 13 from the Selston Ward, and nine from the Underwood Ward. In addition to these there are several men – chiefly from the Jacksdale Ward – who have been reported by the War Office as missing”.